As an accompaniment to my stuffed flank steak for dinner tonight, I prepared some brown rice. My husband tends to groan under his breath whenever I tell him brown rice is on the menu because he's not a big fan unless it's tossed with other ingredients. 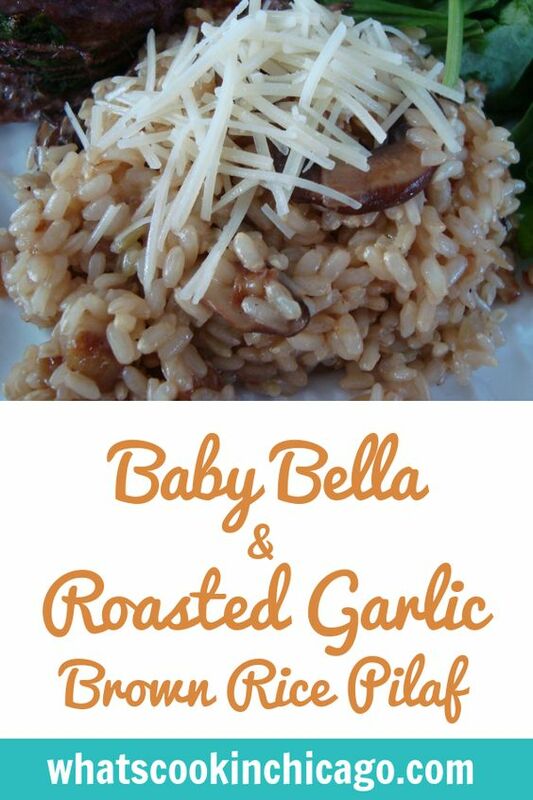 Sometimes brown rice can be pretty bland so to jazz it up, I added some sliced baby bella mushrooms, roasted garlic and some shredded parmesan. Tip - if there's a sale on garlic at the store, take advantage and grab a few even if you didn't plan on it. When you get home, take those garlic heads and roast them so you always have roasted garlic on hand. They're great to add some flavor in so many dishes. Once you roasted the heads of garlic, squeeze them out of their skins and and store in a covered container in the refrigerator for about a week or you can freeze them in an ice cube tray as you would pesto. In a saute pan over medium high heat, add oil and onion. Saute until onions soften. Add the roasted garlic cloves to the pan and mash to blend with the onions. Add the mushrooms and saute until mushrooms soften up and begin to caramelize. In a bowl, combine the prepared brown rice and mushroom mixture. Fold everything together gently. Fold in the parmesan cheese. Serve hot and garnish with more parmesan cheese if you'd like. I love brown rice, hardly anyone uses it. Thanks for the recipe. That is a wonderful idea to jazz up brown rice, I bet even my husband would eat brown rice with all of those mushrooms and dthat cheese on top! Thank you for the recipe! This has my mouth watering! I love all of these things, and they sound fantastic together. Bookmarking! Thanks!